Are you winter weary, tired of backbreaking snow removal, frigid temps, and meager signs of life? Are you eager as a beaver to start gardening? While awaiting spring’s arrival, you can be mapping out plans! According to Landscaping Utah and Utah Snow Removal, two current themes in modern gardening are repurposing and vertical installations. The following designs embody these principles, each one easy to duplicate. Prepare to be enthralled! On a lattice framework, you can either grow plants directly or hang potted specimens. The slats permit airflow while also providing support. A trellis can create privacy, a border, or a focal point. Plastic and vinyl panels are advantageous since they don’t fade, warp, or splinter like wood. Flowering vines that happily climb are clematis, honeysuckle, jasmine, morning glories, and roses. They’re also delightfully fragrant! Vegetables amenable to a trellis are cucumbers, pole beans, tomatoes, and peas. You can grow a variety of potted herbs, the easiest being basil, cilantro, oregano, rosemary, sage, and thyme. You’ll find plastic and vinyl lattice at home improvement stores, such as Lowe’s and Home Depot. 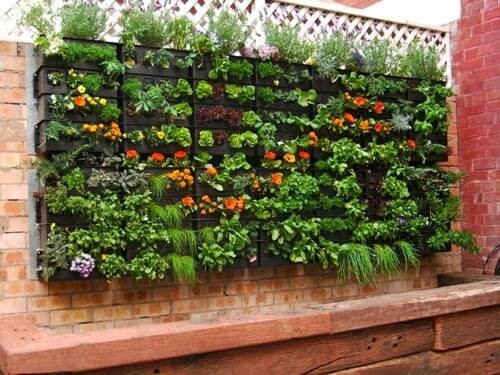 A 4×8′ panel will support a vertical garden for a moderate cost, ranging from $30-$40. To hang pots, suspend them from hooks, pot clips, or brackets. Do you have an old bureau that’s past its prime? Rather than trashing it, take it outside! Pull out the drawers from top to bottom by degrees. You’ll have a compact garden of nestled planters. First, drill holes in the drawer bottoms for drainage. If the dresser has been treated with stain, paint, or chemicals, line the drawers with perforated plastic. Then, fill them with potting soil, the type based on the plants you’ll grow. You can plant veggies, herbs, or small annuals, depending on available sun and water. Edible plants that thrive in shallow soil are strawberries, cucumbers, garlic, scallions, lettuce, spinach, and radishes. Adaptable herbs are basil, chives, cilantro, oregano, parsley, rosemary, summer savory, tarragon, and thyme. 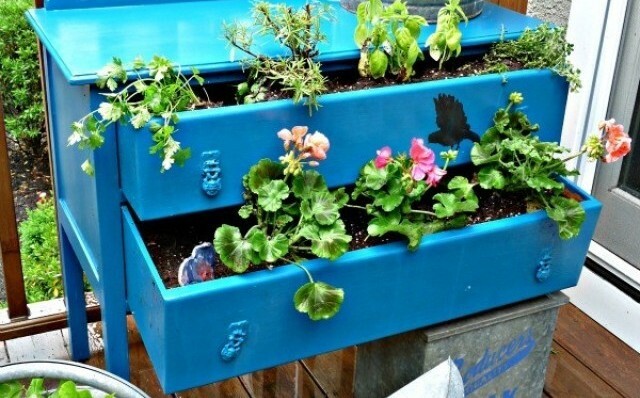 If a dresser is too hefty to bring outside, remove the drawers and use them as standalone planters. Other furnishings you can substitute are desks and apothecary tables. Whether new or weathered, a birdbath makes a charming garden. You can even repurpose a cracked fountain! Should you buy a new one, you may want to keep it indoors during winter, protecting it from damaging weather. First, line the basin with small rocks and stones, for drainage and support. Then, add potting soil and plants, such as flowering annuals or succulents. A garden globe is an eye-catching focal point. For a cascading effect, build up soil in the center. Another option is a miniature rock garden. Do you have an old ladder that’s no longer safe to use? Though it may be somewhat wobbly, it can probably support small potted plants. Before painting the ladder, select containers that will fit the narrow steps. Then, prime and paint the wood. Between the two lowest rungs, rest a large board to stow equipment, such as a watering can. From the ladder hinge spanning the legs, hang “S” hooks to suspend planters. Lastly, place your potted plants, such as annuals or herbs, on the rungs. 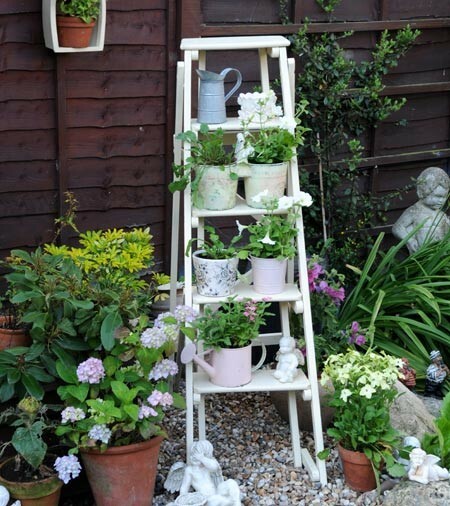 For a pictorial guide, go to: http://www.smalltownrambler.com/diy-ladder-herb-garden/. Container – Choose the type based on the extent of your gardening space. Options are a washtub, planter box, bucket, wagon, or large terracotta pot. Fairy House – Examples of fairy abodes are a birdhouse, toy cabin, teepee, igloo, ceramic mushroom house, or building from a Christmas village set. Plants – Choose them based on the garden’s location, light, and space. Rock garden and alpine plants are ideal, along with succulents, cacti, and herbs. Accessories – Visit a craft or dollar store for fairy furnishings, such as ceramic animals, chairs, bridges, ladders, toadstools, wagons, and wheelbarrows. Household landscaping items to use are corks, pebbles, marbles, seashells, buttons, and craft sticks. Before installing a fairy garden, sketch your design on paper. 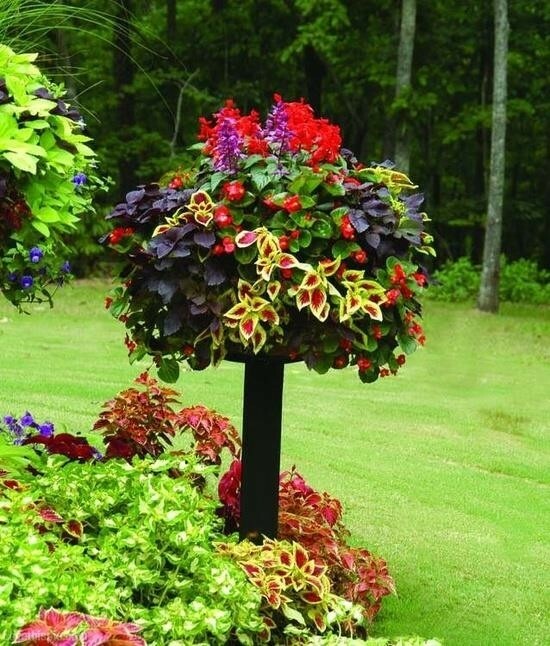 To maximize efficiency and minimize plant disturbance, loosely arrange the items within your container. Then, finalize your setup. 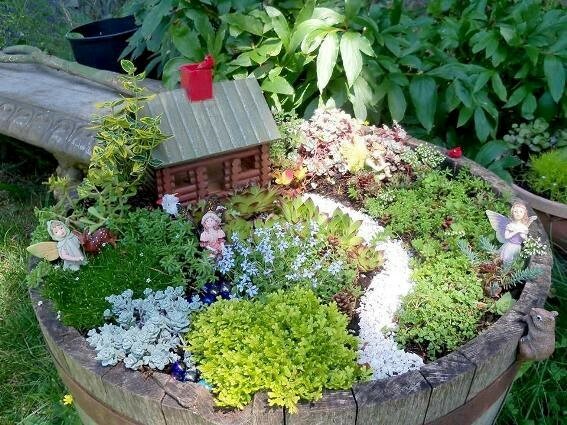 Here you’ll find more ideas, photos, and written tutorials: http://www.today.com/parents/9-enchanting-fairy-gardens-build-your-kids-t15221. To see an inspiring slide show, visit: http://www.countryliving.com/gardening/garden-ideas/g3417/fairy-garden-ideas/?slide=1. For an entirely charming garden, implement all five designs! The focal point can be a birdbath or fountain garden. Set up a lattice garden as a border. 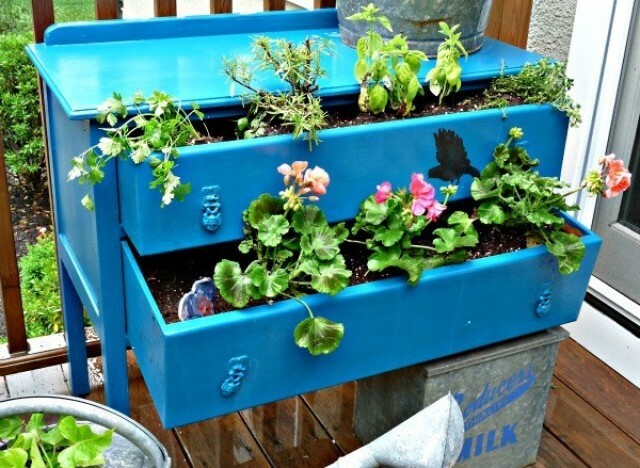 In other sections of your property, create dresser, ladder, and fairy gardens. Then, install a bench from which to enjoy your retreat. Winter days are perfect for garden designing. While harsh winds blow and soil wears a snowy blanket, cozy up with your plans, envisioning spring!